We woke at 8am this morning and got everything ready to cruise after Smudge's morning walk. We expected to see a grey sky and rain but this must have passed over during the night. The ground was wet in places but the cloud was slowly burning off with hints of sunshine beginning to show through. The wind, however, was already breezy and biting cold. First manouver was to wind at the end of the arm. Last time we did this the wind pinned us on the side of the winding hole and I had to bow haul AmyJo round. This time the wind was in our favour blowing from end to the arm entrance. Watched by an elderly gent who openly declared "I'm going to enjoy watching you in this wind", we deftly winded allowing the wind to blow AmyJo's bow around as we did. The gent praised us for an expert job for which we thanked him and headed out. Always use the wind to your advantage I learnt as a dinghy sailor. You don't have to be in a sail boat either. Leaving the arm and turning right to continue to Llangollen. We wanted to stop for water at the services but two hire boats were already there. Again using wind, I eased AmyJo up behind the last boat and got a bow line ashore letting the wind hold AmyJo against the bank keeping the junction clear. Not long and the lead hire boat moved off so we took their spot and filled the water and disposed of the rubbish, then got on our way. This section is very rural with open farmland and open views. At Tetchill is this lovely cottage that would be my ideal place to live if we ever go shoreside. I don't know why but this place really appeals to me. From here on the numerous Gorse bushes are just coming into flower with vibrant yellow flower everywhere you look. In places it makes the canal quite narrow and due to it's twists and turns one has to be alert for oncoming boats. It was busier today with boats on the move, primarily hire boats, but still quieter than normal, however, that has started to change the closer to Llangollen we get. Nice mooring but could be a pain over night to keep feeding the meter. In fact, he is so used to cruising he has now taken to hopping off the boat at the narrow bridge 'oles without warning. On one occasion I had to be quick getting off as well leaving Chris to grab the tiller in an instant. Thankfully I got him back onboard at the next bridge 'ole. He is now on a lead at all times when on the back deck. He's also learnt he can slide off the cratch cover onto the tow path when moored so we can't even trust him on the roof now when not moving. Smudge taking himself off for an impromptu walk with me in pursuit. Only two locks to deal with today, the New Marton locks. These go easily and to save Chris running round to shut the second gate I found I could actually close it from the boat as they are not that deep. View from the side doors as we pass down St Martin's moor straight. We met this wood cutter last year at this point. Don't seem to have cut much wood though and he still has that bottle of booze in his hand. Rounding Lion Keys bridge 'ole we had another boat pull out infront of us. A privateer this time. I put AmyJo hard astern and gave him a blast of the horn. He totally ignored me and dawdled at tickover for well over a mile. I would not mind normally, mistakes can happen and I've done it myself but the ignorant old sod did not even apologise nor acknowledge my presence! Sorry but that makes my blood boil. If you do something like that at least have the decency to apologise. It costs nothing and goes some way to vindicate oneself. Rant over. We reached our destination at Chirk Bank and found a mooring for the night just after bridge 21. Our arrival was quite timely as we had the last available moorings on rings before the Aqueduct. Several hire boats have since past us looking to moor. We are moored just through this bridge. I admit to being a little worried about that leg as AmyJo seems to be making slow progress with this Axiom prop up here against an increasing flow. We struggled in the narrows last time with the normal prop so lets hope the Axiom pushes us through. As you know I'm still undecided whether the Axiom actually performs better. This will be the acid test for the Axiom as far as I'm concerned. If we struggle more than last time its coming off and back to the original prop I'm afraid. 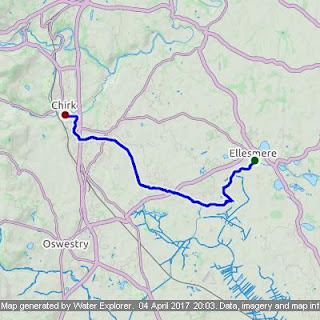 Tomorrow we'll complete the final leg of the trip to Llangollen passing over the Chirk and Pontcysyllte aqueducts then travel the narrows into Llangollen.